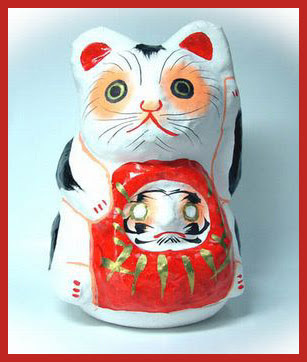 September 29 is the Day of the Manekineko ! 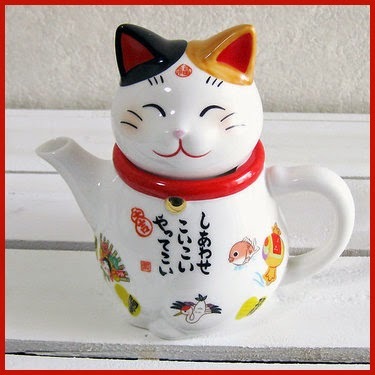 The Maneki Neko (招き猫, literally "Beckoning Cat"; also known as Welcoming Cat, Lucky Cat, Money cat or Fortune Cat) is a common Japanese sculpture, often made of porcelain or ceramic, which is believed to bring good luck to the owner. 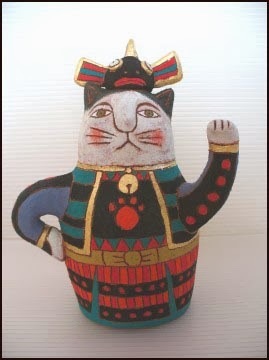 The sculpture depicts a cat (traditionally a Japanese Bobtail) beckoning with an upright paw, and is usually displayed—many times at the entrance—in shops, restaurants, pachinko parlors, and other businesses. 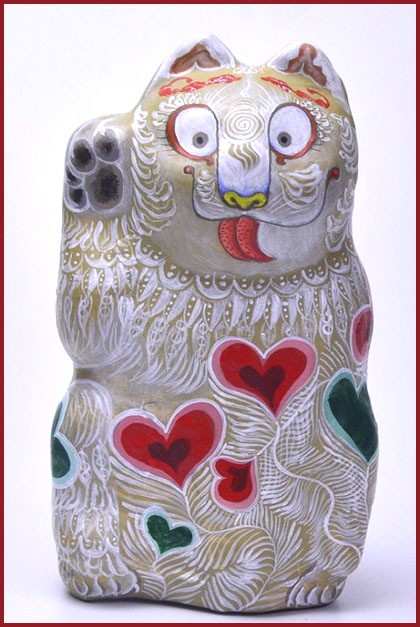 Some of the sculptures are electric or battery-powered and have a slow-moving paw beckoning. 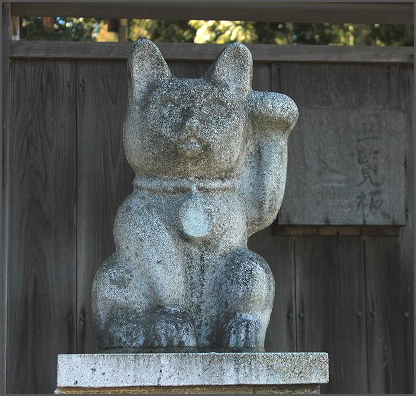 In the design of the sculptures, a raised right paw supposedly attracts money, while a raised left paw attracts customers. 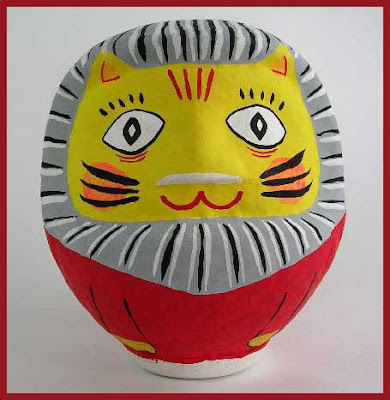 Together with Daruma, it is even more auspicious ! CLICK thumbnail for more photos ! 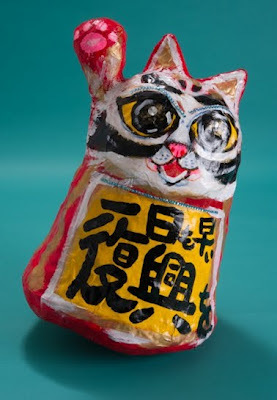 This cat belongs to the Tama Papermachee Dolls. It was bought at the home of Aida san. Look at more pictures on the link above. A five-minute walk from Miyanosaka Station on the Tokyu Setagaya Line, Gotokuji Temple in Tokyo’s Setagaya Ward offers a fun sight for visitors. 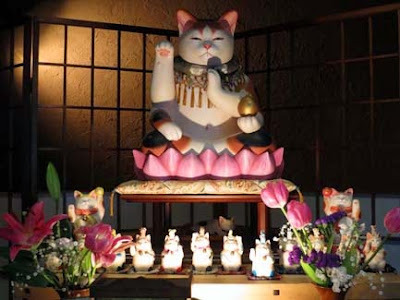 By a path leading to the main temple sit a huge number of bright white cat figures placed around a statue of Kannon, the goddess of mercy. Many tourists visit just to take photos. 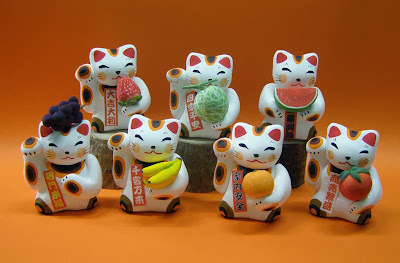 These are maneki neko, beckoning cats, figures that are believed to bring good luck and are said to have originated at the temple. 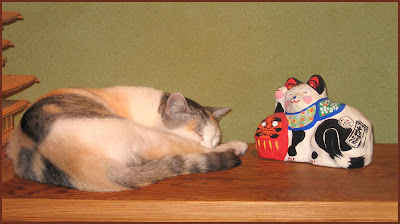 Legend has it that during the Edo Period, a chief priest at the temple, had a cat he cared for very much. 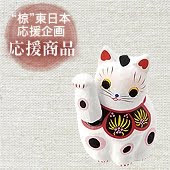 One day, feudal lord Ii Naotaka passed by with his servants and saw the cat, which appeared to be waving at him to come inside. Curious, they entered and were greeted by the priest. As the priest served them tea and offered a sermon, a thunderstorm broke outside. Grateful to the cat and the priest, Ii later donated rice crops and land to the then-poor temple, elevating it to prosperity. The temple became a designated cemetery for the Ii family, whose members served in central roles in the Tokugawa shogunate. 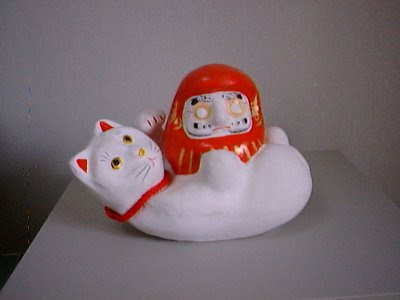 Today, the cats are a symbol of the area. Many maneki neko goods are available in local shops, and feline figures dotted around the neighborhood make it a lovely place to walk. .. .. .. .. .. Legend of the Old Woman in "Imado"
In the last part of Edo period (19th century), there was a old woman who lived in Imado, eastern part of Tokyo. Though she had kept a pet cat, her extreme poverty did not allow her to keep it any more. So she told her cat, "I'm sorry I have to abandon you under this poor situation". "Please make my image in clay. It will surely bring a good luck to you". 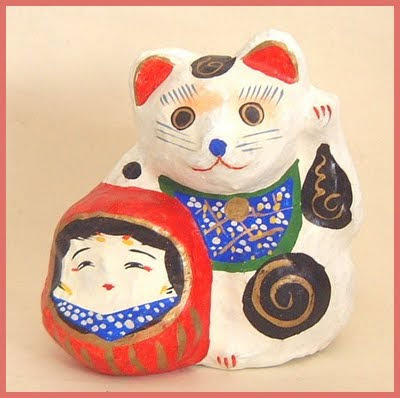 When the old woman made the cat's image in clay following to her dream, guest visited her wishing to buy it. 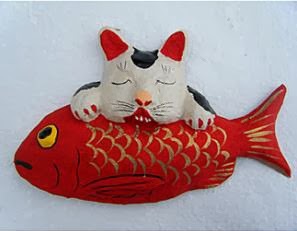 The more the old woman made the cat's images, the more guests visited her to buy them, and she could save money. 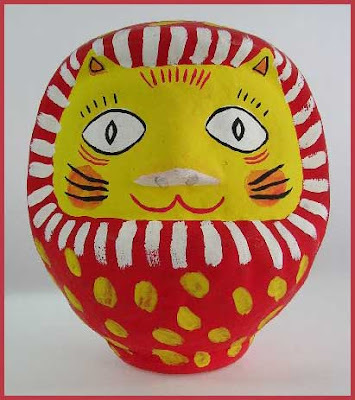 The cat's image in clay which relieved her from poverty was the origin of Manekineko. CLICK for more cats ! 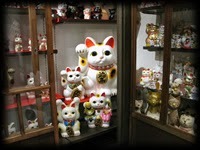 The MANEKI NEKO Museum in Seto is one of the largest exclusive Museum in Japan where exhibiting private collection of thousands of items even a local toy to a curio thing and the miscellaneous goods for daily.. The museum shop and the gallery have also annexed. 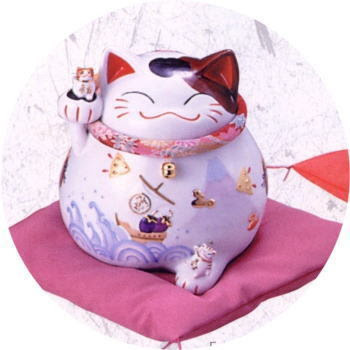 Here is my Photo Album with more beckoning cats and other lucky items (engimono). 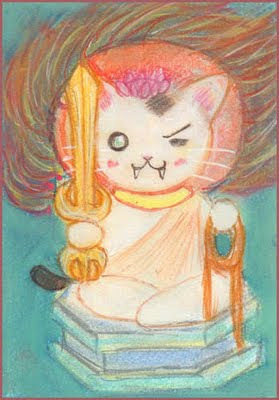 Fudo Myo-O as a cat 不動明王 ! 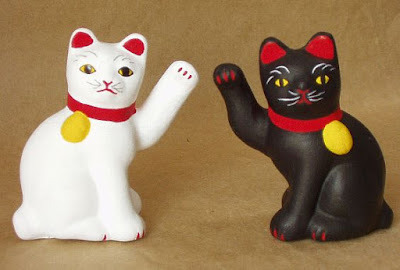 and his manekineko versions !!
. Neko Yakushi 猫薬師 Yakushi Nyorai and the Cat . 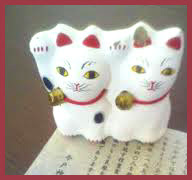 "to bind things together in luck"
Two cats together, for even more good luck. The one on the right is the female. From shrine Imado Jinja in Tokyo. is a Japanese shrine located in Imado where north part of Tokyo Asakusa. It is one of the Shichifukujin (七福神) Shines of Asakusa, and enshrined Fukurokuju (福禄寿). The history of the shrine begins at 1063 by Yoshitomo Minamoto and Yoshiie Minamoto. 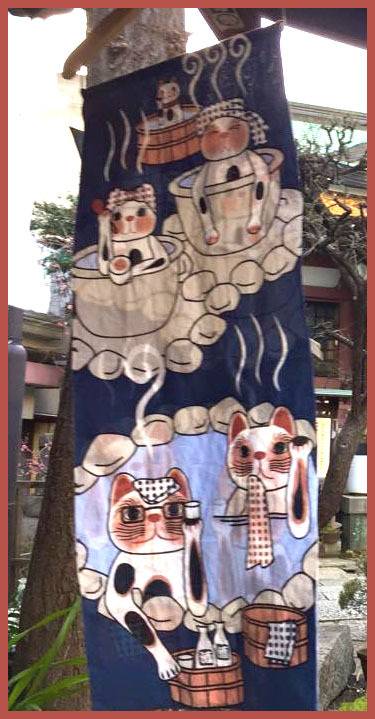 It is very famous for the birth place of fortune cat (招き猫, manekineko), and last place of Soji Okita(沖田総司), the greatest samurai warrior of Shinsengumi(新撰組). Now, it is well known as good luck shrine for love and marriage.
. Amulets and Talismans from Japan - Edo .
. kabuto ningyoo かぶと人形 dolls with helmets . 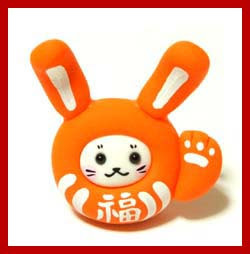 Beckoning good luck for Tohoku ! All kinds of wooden Easter eggs to help Tohoku ! Welcoming visitors at the Gate ! 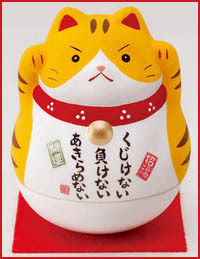 狛犬ポジションに2匹の招き猫。 Two Manekineko like Komainu !
. 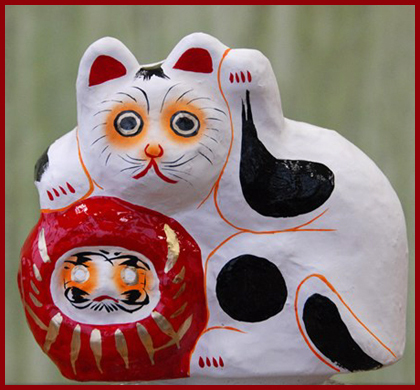 Join the Maneki Cat Friends of Facebook ! . 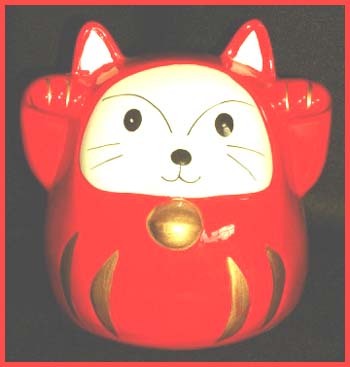 beckoning cat is our largest size of solar toys. 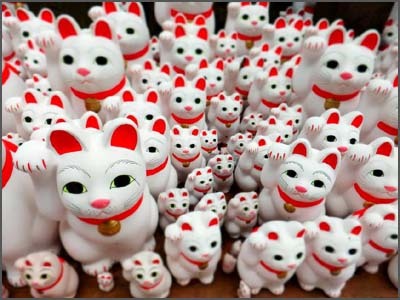 Each cat is 34cm (13 inches) tall and comes in white with a red base. Both the head and the left arm move! Maneki Neko at my halloween party! 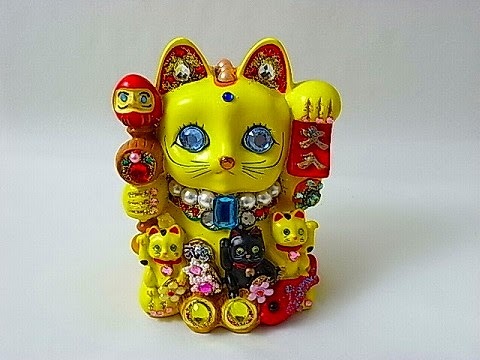 with a lively manekineko !